The Merriam-Webster dictionary describes a book (http://www.merriam-webster.com/dictionary/book) as “something that yields knowledge or understanding” and that it is the source of the “the total available knowledge and experience that can be brought to bear on a task or problem”. I just completed reading a book that does true justice to the definition above. The book was “SQL Server Interview Questions and Answers”, authored by Pinal Dave (blog) and Vinod Kumar (blog), both of whom have been a source of inspiration to the entire SQL Server community and enthusiasts like myself. The book arrived at my door a couple of weeks ago, and the first thing that surprised me was the size of the book. It’s a nice little book – convenient enough to carry around wherever you go. Just skimming through the 207 odd pages brought another surprise. The pages are of good quality, and if you are in a habit like me to scribble little notes in the margins, you will be surprised with the large “notes” space that you get. The fonts are large and comfortable to read, preventing eye-strain. These are the advantages of a printed book! The book was already on its way to becoming a winner. Although the name contains the word “Interview”, this book is much more than just an interview questions guide. As you start reading the book, what you realize immediately is that this small package covers almost everything under the SQL Server umbrella, and caters to multiple audiences of multiple proficiency levels. This is not a book just for learners; it’s not supposed to be. I would recommend that everyone working with Microsoft SQL Server for more than half of their day should get a copy of this book. Why? Think of it as a quiz. As you start answering the questions from this book, you begin to get a deeper understanding of the basics of Microsoft SQL Server. To aid the discovery process, there are reference links that are available where one can go to for additional information. Most of them lead to Pinal’s blog, which we all know is a goldmine in itself! For engineers already having practical, hands-on experience on SQL Server, this book is a refresher course on the basics. It is a ready-reckoner for every SQL Server developer & administrator. For those who have had the privilege to listen to Pinal & Vinod presenting various sessions at Tech-Ed & Community Tech Days or for those who read their posts regularly, the simplicity of the language used in the book will not surprise you. It is really hard to keep things simple, and the hard-work of both the authors deserves a round of applause – they have kept things simple enough for the rookie, while packing enough content to excite the professional. (Spoiler alert!) For example, you can read the answer to the question – “Why can there be only one clustered index on a table?” which can be found on page #92. The concept is a complex one, but the way it has been treated makes it so simple to understand. The book takes it all! A 5/5 rating! With real world questions and practical answers, this is one book you simply cannot afford to miss. Happy reading! 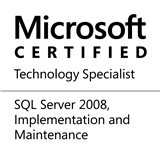 This entry was posted in #SQLServer, Blog, Imported from BeyondRelational and tagged #SQLServer on December 19, 2011 by nakulvachhrajani. Thank you so much. We are motivated! You have truly captured the feeling of this book. This is the most comprehensive review we ever have. Thank you so much. Thank-you for the kind words, Pinal and Vinod!